One of my most celebrated passions is being able to photograph people/places while they are still new, so as to be able to look back on the photos in the future and reminisce on how much time has passed and how much those people/places have grown. This was my pleasure when taking photos of a local up-and-coming band, The Fine Line. The band, whose members met years ago through friendship and simple love of music, gives off a presence of youthfulness and energy that has the ability to brighten one’s mood. This made taking photos an extremely pleasant experience for the band and I, and one that I would gladly share again. The band formed in the summer of 2013 when the members began to meet and play songs that they shared common interest in. Eventually, band practices became a regular part of their schedule, and with their first live performance at a small party in the Santa Clarita area the formation of the band was complete. The band is made up of four high school students who attend school in Santa Clarita: Steven who sings lead vocals and plays lead/rhythm guitar, Andy who sings backup vocals and plays lead guitar, Tyler who plays Bass, and Josh who plays drums. These four were united by the passion of artists such as The Beatles, The Rolling Stones, and Led Zeppelin. However, their eclectic music style extends farther than the roots of Classic Rock as they cover artists such as Blink-182, The Clash, Weezer, and Panic! At The Disco. 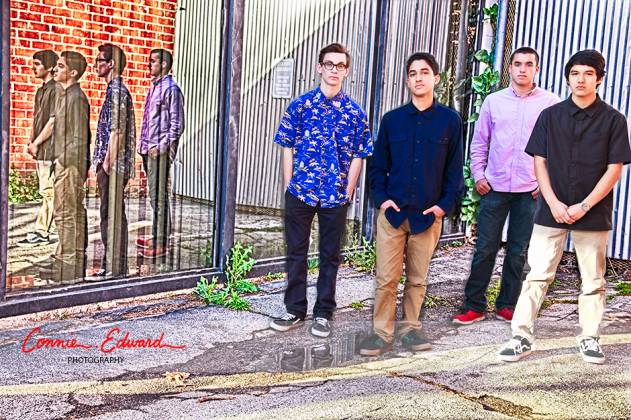 I had an amazing time photographing these fine, talented young men who have a bright future ahead of them. I look forward to looking at these photos several years from now to remember the beginnings of this wonderful music group, and I hope that they will do the same. © 2019 Connie Edward Photography|ProPhoto Custom Blog by NetRivet, Inc.